Environmental technology is an engineering field that shows how math, computer technology and the sciences can be used to preserve the environment. Those interested in formal education in this area can pursue related associate's, bachelor's and master's. Field work usually starts at the bachelor's degree level. Some bachelor's and master's programs also offer specializations within the curricula. According to the U.S. Bureau of Labor Statistics (BLS), employment for environmental engineering technicians is predicted to grow at a rate of 18% between 2012 and 2022, with a mean annual wage of $51, 030 as of May 2014 (www.bls.gov). 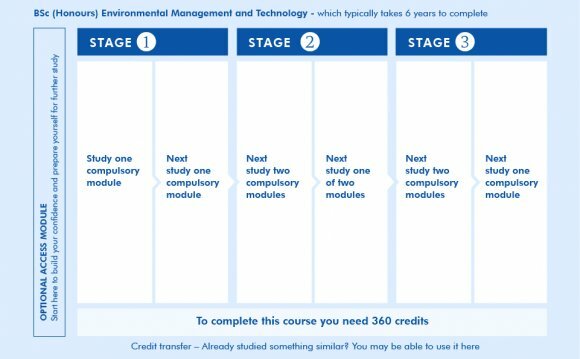 The National Environmental Health Association (NEHA) runs a voluntary certification program for associate's graduates (www.neha.org). Individuals are required to earn at least 12 hours of continuing education credits every 2 years for credential reinstatement.